The Monk Kyriakos was born at Corinth into the family of a presbyter of the cathedral church, John and his wife Eudoxia. The bishop of Corinth, Peter, being a kinsman and seeing that Kyriakos was growing up as a quiet and sensible lad, made him a reader in church. Constant reading of the Holy Scriptures awakened in him a spirit of love for the Lord and of a yearning for a pure and saintly life. Once, when the youth was not yet 18 years old, during a church service he was so deeply moved by the words of the Gospel: "Whosoever would to come after Me, let him deny himself and raise up his cross and follow Me" (Mt. 16: 24), that immediately – not returning home – he went to the harbour, got onto a ship and set off to Jerusalem. Having visited the holy places, Kyriakos dwelt for several months at a monastery not far from Sion in obedience to the hegumen Abba Eustorgios, by whose blessing he made his way to the wilderness Laura of the Monk Euthymios the Great (Comm. 20 January). The Monk Euthymios, discerning in the youth great Divine gifts, vowed him into the monastic form and set him under the guidance of the Monk Gerasimos (Comm. 4 March), pursuing asceticism at Jordan in the monastery of Saint Theoktistos. Saint Gerasimos, seeing the youthfulness of Kyriakos, ordered him to live in the regular community with the brethren. The young monk easily accomplished the monastic obediences, – he prayed fervently, he slept little, food he partook of only every other day, nourishing himself but with bread and water. During the period of great Lent Saint Gerasimos, having set out according to custom into the Ruv wilderness returning to the monastery only on Palm Sunday, – began also to take Kyriakos with him. In the complete solitude the ascetics redoubled their efforts. The Monk Gerasimos each Sunday communed his student with the Holy Mysteries. After the death of the Monk Gerasimos, the 27 year old Kyriakos returned to the Laura of the Monk Euthymios, but he too was no longer among the living. The Monk Kyriakos asked for himself a solitary cell and there he pursued asceticism in silence, communicating only with the monk Thomas. But soon Thomas was sent to Alexandria where he was ordained bishop, and Saint Kyriakos spent 10 years in total silence. At 37 years of age he was ordained to the dignity of deacon. 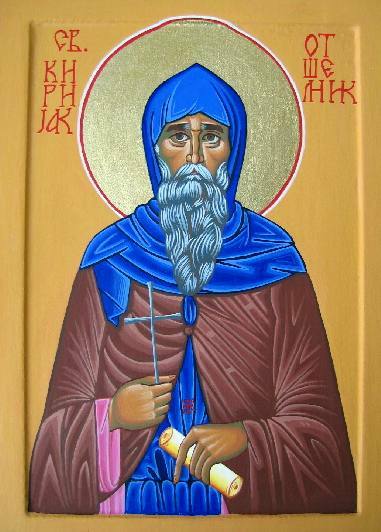 When a split occurred between the monasteries of the Monk Euthymios and the Monk Theoktistos, Saint Kyriakos withdrew to the Sukea monastery of the Monk Chariton (Comm. 28 September). At this monastery they took in monks entering anew as new-beginners, and so also was Saint Kyriakos received, humbly toiling at the regular monastic obediences. After several years the Monk Kyriakos was ordained priest and chosen canonarch [service canon arranger] and did this obedience for 18 years. The Monk Kyriakos spent 30 years at the monastery of the Monk Chariton. Strict fasting and total lack of evil distinguished the Monk Kyriakos even among the ascetics of the Laura. In his cell each night he read the Psalter, interrupting the reading only so as to go to church at midnight. The ascetic slept very little. When the monk reached 70 years of age, he went to the Natupha wilderness – taking with him his disciple John. In the wilderness the hermits nourished themselves only with bitter grasses, which through the prayer of Saint Kyriakos was rendered edible. After a period of five years one of the inhabitants found out about the ascetics and brought to them his demon-possessed son, and Saint Kyriakos healed him. From that time many people began to approach the monk with their needs, but he sought complete solitude and fled to the Ruv wilderness, where he dwelt five years more. But the sick and demon-afflicted came to him in this wilderness, and the monk healed them with the sign of the Cross and prayer. At his 80th year of life the Monk Kyriakos fled to the hidden Susakim wilderness, where two parched streams passed by. According to tradition, the holy Prophet David brought Susakim to attention: "Thou driest up the river Itham" (Ps. 73 : 15). After seven years brethren of the Sukea monastery came to him, beseeching his spiritual help during the time of onset, through the sufferance of God, of debilitating hunger and illness. They implored Saint Kyriakos to return to the monastery, and the monk settled into a cave, in which the Monk Chariton had earlier asceticised. The Monk Kyriakos rendered great help to the Church in the struggle with the spreading heresy of the Origenists; by prayer and word he returned the misled to the true way, and strengthening the Orthodox in their faith. The author of the Vita (Life) of the Monk Kyriakos, a monk of the Laura of the Monk Euthymios named Cyril, was a witness, when the Monk Kyriakos predicted the pending death of the chief heretics Jonah and Leontios, and soon the heresy would cease to spread. The MostHoly Mother of God Herself commanded the Monk Kyriakos to keep to the Orthodox teaching in its purity: Having appeared to him in a dream together with the Saints John the Baptist and John the Theologian, She refused to enter into the cell of the monk because in it was a book with the words of the heretic Nestorius. "In your cell – is My enemy", She said (Comm. of appearance of the MostHoly Mother of God to the Monk Kyriakos is 8 June). At his 99th year of life the monk Kyriakos again went off to Susakim and lived there with his disciple John. In the wilderness an huge lion waited on the Monk Kyriakos, protecting him from robbers, but it did not bother wandering brethren and it ate from the monk's hand. Once in the heat of summer all the water in the pit dried up, where during winter the ascetics had stored up water, and there was no other source of water. The Monk Kyriakos prayed, and here amidst the desert there poured forth copious rain, filling the pit with water. For the two years before his death the Monk Kyriakos returned to the monastery and again settled into the cave of the Monk Chariton. Until the end of his life the righteous elder preserved his courage, and standing with fervour he sang. He was never without deeds, either he prayed, or he worked. Before death the Monk Kyriakos summoned the brethren, gave blessing to all and with a prayer he quietly expired to the Lord, having lived 109 years.